Walter Miller's medal index card of 1916. Walter Miller's TFE Medal card, 1918. Walter Miller is remembered on the Methodist Roll of Honour in Bottesford, and is one of the men on the Bottesford ‘church list’ of WW1 Servicemen. Walter Miller was born on the 20th February, 1887 and baptised on the 10th April that year in Bottesford, the son of William and Elizabeth Miller. His father was born in 1859 in Bottesford, and his mother (neé Hollingsworth) in 1862, also in Bottesford. In 1881, William Miller was working as a general servant to Thomas Jackson, a butcher who owned land and lived on Nottingham Road and was a butcher. By 1891, William had moved to the High Street and was trading in his own right as a butcher. At this time, they had three children: Florence (8), Edith (6) and Walter (4). In 1899, Walter was awarded a County Junior Scholarship, and it was noted in the School Log Book that he was placed 9th in the county lists. In the 1901 census, the family were at the same location. Florence, now aged 18, had become a milliner. The 1911 census records that all the family, including Walter, were assisting in the family butchery business on the High Street, truly a family business. Two and a half years later, on the 23rd September, 1913, Walter married Edith Maria Etches in Bottesford. The Etches family were recorded in the 1901 and 1911 censuses. They were evidently wealthy. In 1901 Charles (living on own means) and Clara Etches lived at 1 Belvoir Road with their daughters Violet (12), Edith (10) and Dorothy (4). Charles Etches was one of the Private Residents listed in Kelly’s 1908 directory of Leicestershire, his address given as Arnold Lodge. However, it Charles Etches died not long after this date, in 1909. In the 1911 census, Clara Etches is a widow of independent means living at 21 Belvoir Road, with her three daughters, now age 22, 20 and 14, none having to work. Edith was 22 when she got married. Walter Miller’s service record has not been located. However, he kept a diary from the 5th August 1014 until the 9th April 1916, of his service with the Leicestershire Regiment. This has been published online at http://ww1waltermiller.co.uk/ . It states that Corporal Miller re-enlisted after being discharged in April 1916, adding that no diary of this later period is currently known to exist other than his second Regimental number of 20392. From his diary we learn that Walter Miller had been commissioned and had served with the Territorial Army before the outbreak of war. He was mobilised on the 5th August 1914, immediately Britain declared war on Germany, and was posted as a Private in the 1/5th Battalion, Leicestershire Regiment, and travelled to join his unit at Luton. His duties included all aspects of the butchery trade. He was promoted to Corporal on the 1st September 1914. The battalion arrived in France on the 28th February, 1915, where it was held in reserve. In January 1916, it was on the point of being transferred to Egypt. The diary displays his Medal Index Card, which states that he was discharged on 17 April 1916, his name deleted from the 1914-15 Star medal roll, and apparently also from the Victory Medal roll, presumably because of his early discharge, though it does not state the reason for his early discharge. Further search online revealed that his entry in the Medals and Awards Roll still exists, and this indicates that his later Service Number was in fact 203929 and that he served with the 1/4th Battalion, Leicestershire Regiment. There is also a second Medal Index card which indicates that he was awarded the TFE medal on the 1st December 1918. This refers to the Territorial Force Efficiency medal, which was awarded for a minimum of 12 years of service in the Territorial Force, with war service counting double. Given that he joined the Leicestershires in 1914, he had served in the war for some four years before he received the award, which would have been regarded as eight years (war service counting double). Therefore, it seems that he must have first joined the Territorials four years before the start of the war, in 1910, as a part-time soldier. His discharge in 1916 may well have been simply because he had completed the period of service that he had signed up for back in 1910. 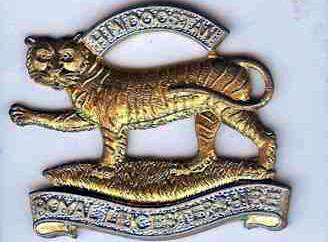 He then chose to re-enlist, retaining his rank as becoming Corporal in the 1/4th Battalion Leicestershire Regiment. It appears that at the end of the war he was awarded the 1915-Star, the British War Medal and the Victory Medal, as well as the TFE medal. Both the 1/4th and 1/5th Battalions formed part of the 138th Brigade 46th (North Midlands) Division. This was heavily involved with fighting on the Western Front from 1915 to the end of the war, apart from a short time at the end of 1915 when it was ordered to Egypt only to be brought back again to France almost immediately. On his return from the war, he continued as one of the three butchers in the village. His premises were still on the High Street, as seen in electoral rolls from the 1920s. He would ride out on his bike and go rabbiting. He owned the land at the back of his house on the High Street, and eventually sold it so that the bungalows and flats on Granby Drive could be built. He was a Trustee of the Bottesford Friendly Society. In 1939, Walter described himself as a shopkeeper butcher. He and Edith lived on Queen Street with farmer John W. Miller (1914), Gwendoline Boyes (nee Miller, born in 1917) and Walter’s mother Elizabeth, described as a widowed and incapacitated woman aged 82. She died in 1944 and was buried at Bottesford on the 6th January. His father William had died in 1934, buried at Bottesford on the 3rd November. Walter Miller died in Bottesford during February 1962, and was buried on the 22nd February, aged 74. Edith his wife died during the following year and was buried at Bottesford on the 9th March. Served as a Territorial before the outbreak of WW1.